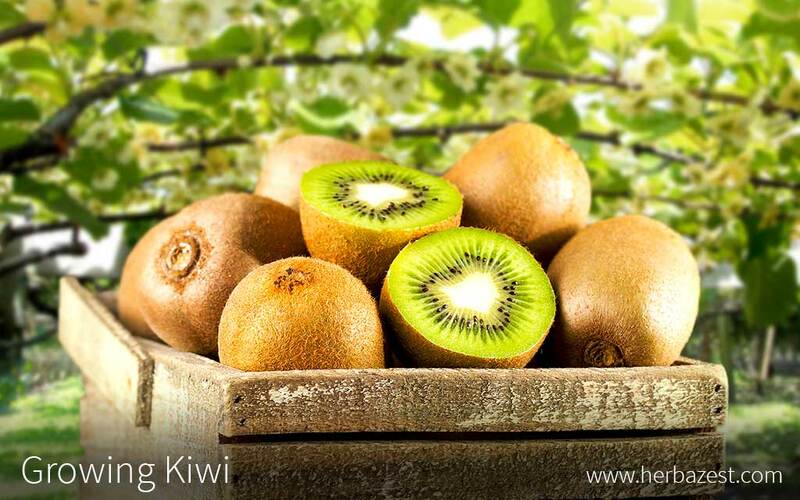 Kiwi is typically grown in forest areas and is mainly cultivated in New Zealand for commercial use, but with great care and attention to detail, kiwi can be successfully grown in a home garden. Frequent but moderated. Low-salt water. Avoid chloride, bicarbonate, boron, and sodium. While growing kiwi plant can be a lengthy process, it is cultivated all over the world for the juicy flavor and nutritious qualities of its fruit. The following growing guidelines offer valuable advice about how to plant and take care of kiwi. Kiwi requires fertile, well-drained soil in order to grow successfully. The soil should be tested and kept within the pH range of 5.5 - 7.0. If the soil is poor, the leaves may experience nitrogen deficiency, but if it is too rich, the fruit will become sensitive to alkaline conditions and have high sodium content. Incorporating organic matter before planting would be beneficial, and good drainage is essential in order to avoid damaging the kiwi vine roots. One solution for preventing root rot due to heavy soils is planting the vines on raised beds. Covering these beds with plastic wrap helps prevent soil evaporation, providing the roots with plenty of water to grow. Once the cuttings have grown some roots and shoots, they should be transferred into gallon-sized pots for further development into three- to five-foot (90 - 150 cm) tall plants, ready to be planted in the garden. When placing the cuttings in the containers, it is recommendable to apply a slow-release fertilizer at suggested rates usually two times during the growing season (preferably March and July). One teaspoon of slow-release fertilizer per gallon pot is enough. Each container will need five- to six-foot (1.5 - 2.0 m) tall bamboo stakes in order to grow straight kiwi vines. Don't allow the kiwi stem to wrap around the bamboo. As the vine keeps growing during the summer, pinch the end of each shoot whenever it begins to wind around itself. Kiwifruit plants have a high water requirement. Plants grown in gallon-sized pots should be watered daily. Plant your well-developed cuttings early in the spring, after the risk of frost has passed. Apply mulch to the base of each vine with wood chips, straw, or compost. The selected area should offer protection from the afternoon sun and winter sun. Although kiwi vines thrive in full sun, they are extremely susceptible to frost and wind damage, as well as to hot, dry conditions. Choosing northern exposure can help reduce that risk by delaying growth; placing them to the east of a treeline or a building structure is likewise helpful. It is important to choose a location that also allows for air circulation. Kiwi vines are well-known for their climbing abilities. The strength of the vines can be affected by different variables, such as the cultivar, altitude, and latitude. While it is a big expense, strong support structures, such as a trellis or patio covers, are necessary for the plant to grow upon. Kiwi is a dioecious plant, meaning that it has both female and male organs, which play a key role in producing the kiwi fruit. The female plants have well-developed ovaries, which are fecundated by the pollen from the stamens of the male plants. After pollination, the ovaries develop into fruit. Typically, in order to increase propagation, one male plant is cultivated for every eight female plants. For best results, all plants should flower during the same period. The most common pollinator for kiwi tends to be honeybees, but it is also possible to use controlled pollination by manually applying the pollen to female flowers. The kiwi plant is typically propagated using softwood cuttings taken in June, July, or August. Though budding or seedlings are also possible ways of propagation, those methods delay growth and increase the risk of frost damage. The cuttings are obtained from mature, current season shoots, typically three to six inches (8 - 15 cm) long. Two to three stem pieces will be sufficient. However, make sure the leaves are full size and the buds can be seen clearly at their base. Cut the lowest bud of each shoot and get rid of the leaves, except for the upper one. Cut the blade portion of the remaining leaf in half, removing the outer half. Trim the top of the cutting, leaving only half an inch (1.3 cm) or less of the shoot projecting from the point of attachment of the remaining leaf. Using a knife, peel 0.5 - 0.75 inches (1.3 - 2.0 cm) of the bark on two sides of the base of the stem. Submerge the peeled half of the cuttings in a plant hormone solution for around five seconds and then place them into root beds or small pots for 60 days or more. Rooting hormones can be found in garden supply houses and some farm stores. The cuttings must be moistened frequently, with approximately five seconds of mist every five minutes during daylight hours. If you are using soil as a medium, it should be sterilized before placing the cuttings in order to prevent soil-borne fungi contamination. During the incubation period, the cuttings should be protected from wind and receive only 50% of the normal light, preferably in a greenhouse. Do not fertilize kiwifruit plants during their first year. Kiwi vines are incredibly sensitive to fertilizers, and improper care could cause the roots of the vines to burn. Once established, the plants should be fertilized monthly with small amounts of nitrogen, depending on the age of the plant. Kiwi vines are sensitive to chloride, so make sure to avoid fertilizer that uses that has potassium chloride (KCl) in it. Zinc and iron are sometimes needed when plants show deficiency symptoms. If the pH needs to be lowered, apply sulfur to the soil or acid in the irrigation water. Kiwifruit vines require lower-salt water than other fruit crops do. Chloride, bicarbonate, boron, and sodium are the most damaging. The most commonly-used irrigation systems for kiwifruit vineyards are drip irrigation (mostly for rapid growth of young vines) and mini-sprinklers, which can spray water in a circular patterns 6 - 18 feet (2.0 - 5.5 m) in diameter. Drought-stressed plants are prone to smaller fruit and premature berry drop, and they are more susceptible to winter cold injury. Two or three times during summer, cut non-flowering laterals of the vine close to the chosen support system. Trim flowering shoots back to four to six leaves beyond the last flower. In the dormant season, get rid of the sticks that fruited last season, as well as any that are dead, diseased, or tangled. Keep the best one-year-old lateral sticks that haven't fruited, spaced about a foot (30 cm) apart along the arms. Trim them back to about eight buds. Protect the trunks of young vines from cracking in cold temperatures by wrapping them with cloth or painting them with white latex paint. It is important to keep weeds and grass away from the base of kiwifruit vines to prevent competition for water and nutrients. Plants benefit from a thick layer of organic mulch - three to four inches (8 - 10 cm) - which helps control weeds, adds organic matter to the soil, and aids moisture retention. Kiwi plants are often damaged internally and externally by pests. The common brown garden snail (Helix aspersa) eats the buds of the kiwi vine, which can reduce the growth of young plants. Hardly-visible nematodes can damage the root system by causing nodules or knots on the roots of the vines. The outside of the plant can be damaged from contact with snails, rabbits, and cats. Cats are especially worrisome because there are substances within the trunks that attract cats, and cats love to rub up against the plant. If the plant is young, this can rub off any emerging shoots. Other pests that can cause harm are deer, gophers, armored scale insects, leaf rollers, caterpillars, thrips, beetles, and spider mites. Kiwi plants take three to four years to bear fruit, but full maturity is not reached until 8 - 10 years. Be careful not to pick the fruit too early, as this can result in a significant drop in fruit size and yield. The ideal time to harvest would be around November 15th, with all of the fruit included in one picking. When the seeds inside the fruit are fully black, the fruit is ready to be harvested. The best method for harvesting is by hand, wearing gloves to protect the skin of the fruit from damage. Even though the fruits may seem hard, they can be easily damaged during harvesting if the process is not completed with care. Be sure to keep the picked kiwifruit in the shade while completing the harvest. Place the fruits in plastic bags and cool them as soon as possible; otherwise, the fruit may shrivel up. Once kiwi is harvested, it must be kept in very strict storage conditions in order to preserve the fruit. The storage area should be kept close to 32°F (0°C) at roughly 90 - 95% humidity. If the temperature goes below 32°F (0°C), it could suffer frost damage; therefore, close monitoring of the temperature is essential. Continuously check to make sure that the storage space is ethylene-free, as exposure to ethylene could promote ripening and fruit softening. Oxygen circulation is also important, because if the fruit experiences anaerobic respiration, it will develop an off flavor. Kiwifruit has a storage life of roughly three to six months, but even under ideal conditions, about one-third to one-half of skin firmness may be lost with each month of storage.